Scroll Down to the end for instruction. My iguana was getting to big for his cage and needed a new one. I was given a used entertainment center and thought it would make a great new cage for him. This is my first project using power tools, other than a drill/driver, so it took me a while to make, since I had to learn what tools in my kit I could use. In the last picture the cage is completely together. The only thing it is missing is the branches that the iguana can climb on. Which will be added soon. If you have multiple pets you can section off the top from the bottom and have two cages. 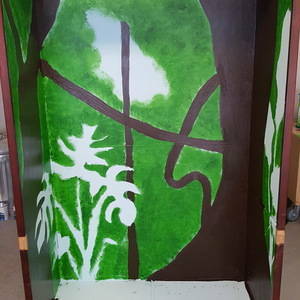 Another thing you can do is keep the top half as a cage and the bottom half as storage for food and cleaning supplies. 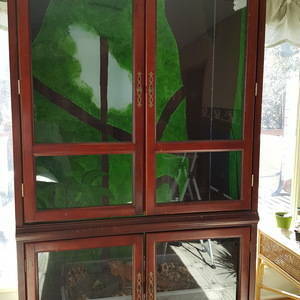 In my case, Iguanas need a lot of height so I gave him the whole inside of the entertainment center. You can add as much detail inside the cage. But for me I wanted something that is easy to clean. So I have a container at the bottom that I can pull out and clean. The branches will have the interconnecting brackets so I can remove them to clean and to clean the walls. Converting an entertainment center into a cage. 1. Remove everything, including the flimsy backing, leaving just the shell. 2. Cut all openings. This included holes for ventilation and lighting. Make sure there is plenty of space for the heating lamp to vent, you don't want the wood to catch on fire. 3. Sandpaper all openings and the inside to remove old finish and sharp edges. 4. 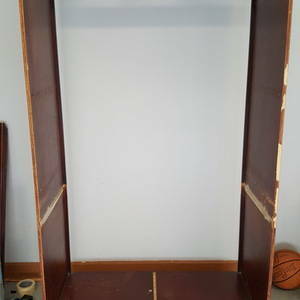 Attach new plywood to the back using wood screws and glue. 5. Paint inside and doors whatever colors you want. 6. Polyurethane the inside, doors, and all openings multiple times. 7. Attach plexiglass on doors. 10. 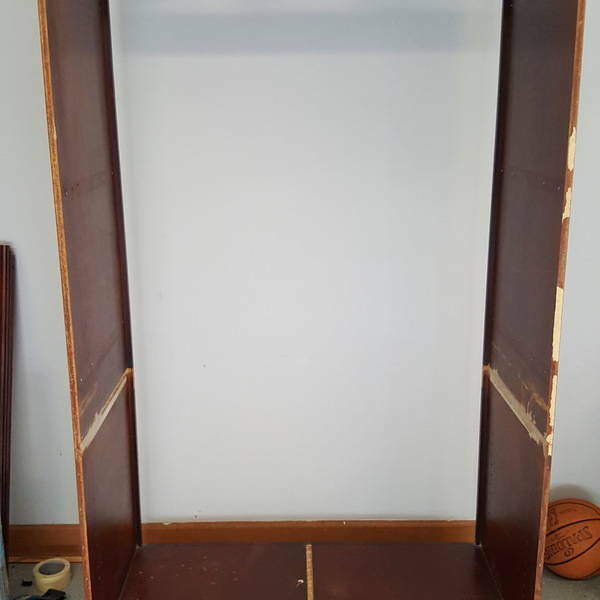 Add any extra parts that you want to keep from the original entertainment center. 14. Remember to let it air out for a few days before adding any animals. Scroll Down to the end for instruction. My iguana was getting to big for his cage and needed a new one. I was given a used entertainment center and thought it would make a great new cage for him. 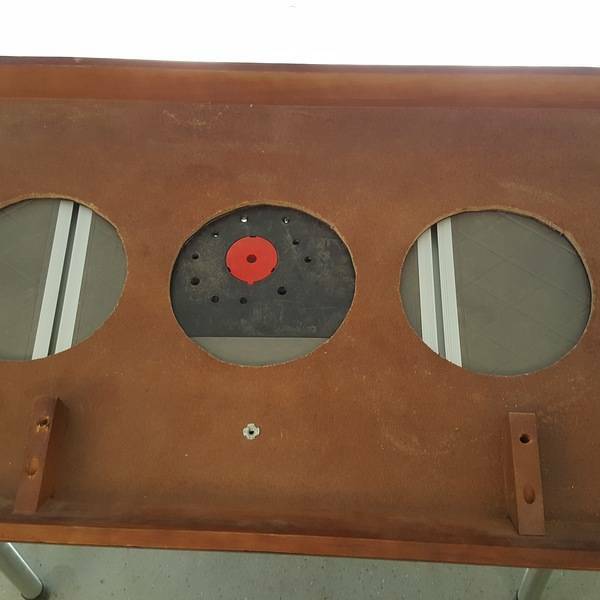 This is my first project using power tools, other than a drill/driver, so it took me a while to make, since I had to learn what tools in my kit I could use. In the last picture the cage is completely together. The only thing it is missing is the branches that the iguana can climb on. Which will be added soon. If you have multiple pets you can section off the top from the bottom and have two cages. 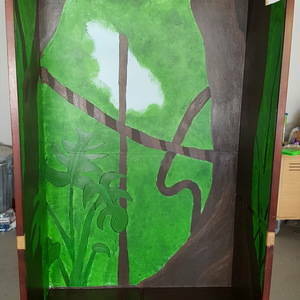 Another thing you can do is keep the top half as a cage and the bottom half as storage for food and cleaning supplies. 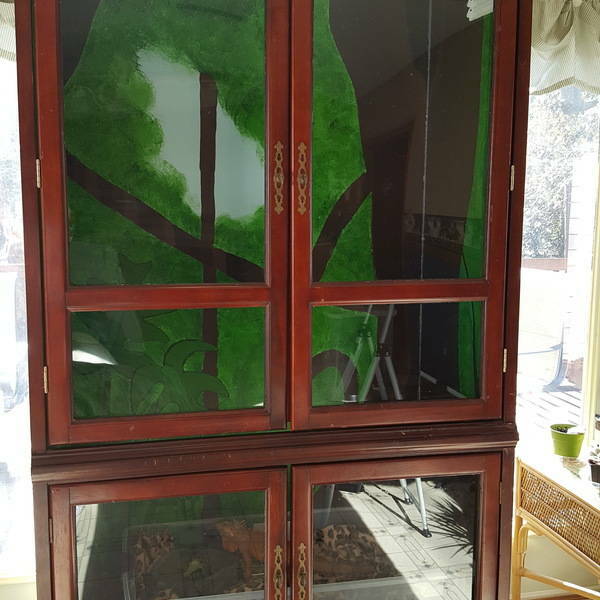 In my case, Iguanas need a lot of height so I gave him the whole inside of the entertainment center. You can add as much detail inside the cage. But for me I wanted something that is easy to clean. So I have a container at the bottom that I can pull out and clean. The branches will have the interconnecting brackets so I can remove them to clean and to clean the walls. Converting an entertainment center into a cage. 1. Remove everything, including the flimsy backing, leaving just the shell. 2. Cut all openings. This included holes for ventilation and lighting. Make sure there is plenty of space for the heating lamp to vent, you don't want the wood to catch on fire. 3. Sandpaper all openings and the inside to remove old finish and sharp edges. 4. 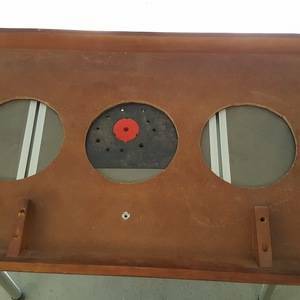 Attach new plywood to the back using wood screws and glue. 5. Paint inside and doors whatever colors you want. 6. Polyurethane the inside, doors, and all openings multiple times. 7. 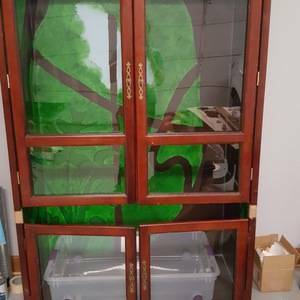 Attach plexiglass on doors. 8. Caulk all edges. 9. Attach Doors. 10. Add any extra parts that you want to keep from the original entertainment center. 11. Attach Caster Wheels. 12. Decorate inside. 13. Add animal. 14. Remember to let it air out for a few days before adding any animals.